Thrill seekers young and older will enjoy the adrenaline rush of crossing the Highline 179 Suspension Bridge. Are you planning a trip to Garmisch or any of the surrounding southern Bavarian areas and looking for additional activities beyond Munich and Neuschwanstein Castle? You are in luck! Mommy and Me Travels found a unique hike that led up to the Highline 179 supsension bridge. You should consider adding it to your vacation and adventures if you are in the Garmisch or Munich areas. Shortly after driving into Austria on your way from Garmisch to the Neuschwanstein Castle, you can’t help but notice a walking bridge high in the sky between two hills. If you are like me, you start to wonder what it is and why it’s there. Well low and behold we ended up stumbling across Highline 179 Suspension Bridge. This is the largest suspension bridge of its kind in the world. 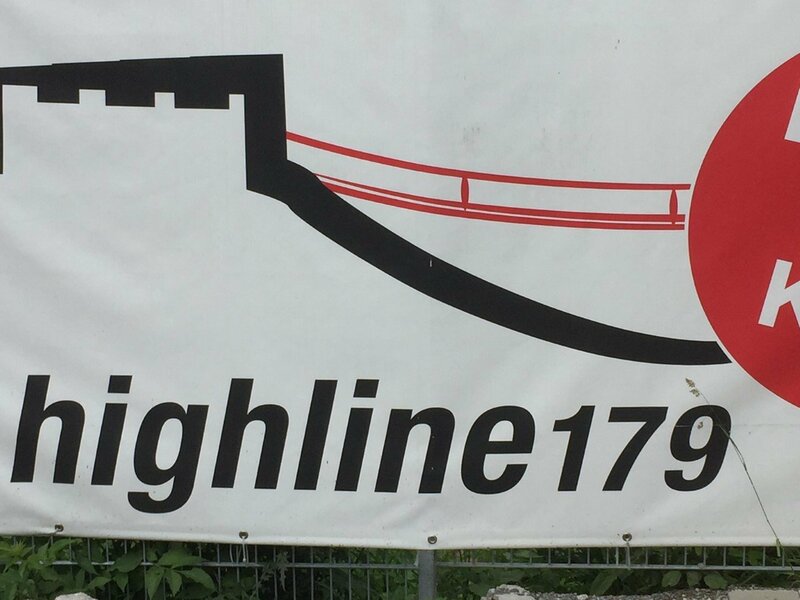 Highline 179 forms a walkway between Fort Claudia and the Ehrenburg fortification. It is 114,60m high, 406m long, and provides 360 degree views for your enjoyment. The bridge opened to visitors in Nov 2014 and then in Dec 2014 it was named as “Longest Tibet-style footbridge” by Guinness World Records. It’s official! Guinness World Record. When driving along B179 you will have no problem spotting the bridge. Although, We did have a little difficulty trying to figure out how to access it. Learn from our mishaps and follow the signs for Burgenwelt Ehrenberg to the parking lot. Don’t forget to pay for parking before you head up to the entrance. From the parking area to the entrance you have to hike up a foot path for about 15 to 20 minutes. Along the path are fun story boards, in both German and English, that make an adventure hike for kiddos and also allow for quick short stops. The path is well marked and can easily be accomplished with children. My 5 year old was able to walk it on his own and it was an easy enough hike to carry my infant. Map highlighting the areas to see and hike to. Kids story that was popular when the castles were inhabited. Another kids story on the way up the hill. The cost to access is the bridge is 8 euro for adults and 4 euro for children 4-14 years old. This is the cost for crossing the Highline 179 suspension bridge rounrip. It allows for you to walk around both ruins on each side of the bridge and then hike down the way you started. For the avid hiker, there is another path you can hike down on the other side of the bridge but it was not as clearly marked nor was it as smooth of a walk from what we could see. We chose to re-cross the bridge (bonus) and then hike down the way we walked up. The ruins at Fort Claudia and Ehrenburg Fortification are free. This makes a budget friendly (and healthy) way to spend a few hours or a whole day. View of the bridge from below. It looks way high up! When you reach the top you can explore around Fort Claudia before crossing the bridge to Ehrenburg fortification and hiking around it. These are 2 of the 4 structures that are part of what is known today as the “Burgenwelt (Castle World) Ehrenberg”. Both structures are ruins but interesting sights for kids to see what happens to buildings over time. My eldest was making a game out of the different structures of trying to guess what each place was used as. He was very creative about the best place to protected against the dragons. LOL. Fort Claudia from the other side of the bridge. The highlight of the trip is of course crossing Highline 179 bridge. The bridge is secure but does sway a little on a windy days. My son thought it was the neatest thing being able to “walk across the sky”. The day we went it was not too crowded but it was windy. The lack of crowds made accessing the bridge easy. We were able to get great pictures with very little wait time for a location. The wind might have kept the faint at heart away. What about you, Are you adventurous enough to try it out? Pleasant welcome to the hike. You can pay once you go through the arches for vehicles in the gift shop doors on your right. The trail quality varied from semi-maintained, as shown, to some weathered areas in steeper areas. View of the bridge and B179 below.from the Fort Claudia side. Mommy and the boys before crossing. 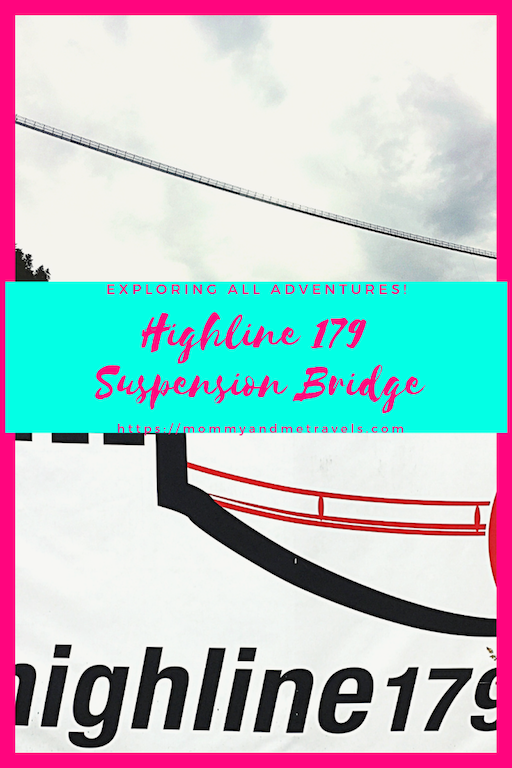 Don’t miss out on the Highline 179 Suspension Bridge! It was definitely a great way to breakup our drive from the castle back to our hotel in Garmish. Want more fun kid friendly adventure ideas for this area? Check out our fun days at Dinosaur Museum Altemuhlta, Therme Erding Waterpark, and Neuschwanstein Castle and Surrounding Areas. You might also be interested in our ideas for a 3 Day Kid Friendly Munich Vacation. Make packing a breeze with these packing cubes. I love getting different colors for everyone in the family. Makes it so much easier to find what I'm looking for. A MUST for family travel! This is our absolute favorite go to carseat for older children when we traveling. You can't get more travel friendly than this compact carseat. The smart travel adapter is the best device to purchase. No matter what country we are heading to we never leave home without it. No guessing which plugs are needed, they are all right in this one little device. We all know that keeping the kids busy when we travel is a MUST. My son's love their travel trays. We take them in the car, on the plane, and whenever we go visit Grandma and Grandpa. If you are like me, you don't want to lug heavy baby items through an aiport or onto a metro. Don't stress any longer. This stroller by Jovial is the perfect combination of comfort for kiddo and easy for mommy. A MUST have for those traveling with a toddler! I am a firm believer in always having a great first aid kit always available when you travel! I like to buy premade ones and add any items that are specific to my kids. In my opinion, having a first aid kit MUST when traveling with kids!